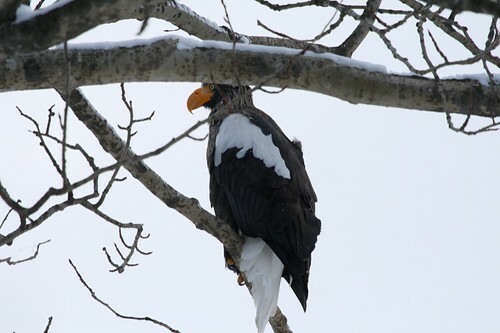 Stellers Sea Eagle at Yakumo. An uncropped photo, this was as close as I'd ever been to a wild eagle before. Shame about the branches obscuring parts of the bird. It actually stayed obligingly still in the tree for a while whilst I tried to get a clear shot and then flew off looking bored and haughty. A wonderful sight and great natural photograph. Two years since I saw one. Went looking for them in Niigata today but found nothing. Not even a White-tail. Very quiet winter here. You have some great sights where you are. The 7D is doing very good work too. It's a fantastic eagle. Looks cold over there from all your pics. It got up to 48c here in Perth the other day, damn that's hot!